Single-piece mats are often the best deal if your area is small enough, but to go really large or to customize the fit to a specific irregular shape or even wall-to-wall coverage you need to go with a puzzle-piece solution. All the mats we review here are specifically designed for working while standing. We do not review playground mats, thin kitchen mats, exercise or yoga mats, or anything else that won’t support you properly for long hours of standing, or won’t endure a lot of abuse. All the mats we review here are made from ¾”-thick, 100% polyurethane, meaning they’re virtually indestructible and can handle the daily abuse of stiletto heels, rolling chairs, welding sparks, harsh floor cleaning chemicals and just about anything you can unwittingly harm them with—short of cutting into them with a sharp knife or repeatedly driving over them with a 6,000 lb forklift. And that means we stick to American-made standing mats here and leave out Chinese-made alternatives that may be a little cheaper but are far less likely to stand the test of time. Because these mats are heavy and a significant portion of their cost structure is in freight, domestically-made large-area mats are usually more economical. One other note about pricing of polyurethane standing mats. Most mats you can buy at Target or Home Depot will use a very thin outer layer of polyurethane but the guts of these mats will be a cheap foam or gel type material. These are designed for barefoot use for short durations, and will lose their buoyancy so quickly that you’ll likely be replacing them every year. 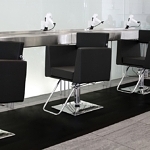 They also tend to accumulate mold in wet environments, curl at the edges, and otherwise fail to perform well in an all-day standing environment. With true 100% polyurethane mats being of unibody construction they are costlier to manufacture. As a rule of thumb at least 80% of the cost of producing these mats is material cost, and hence their prices are fairly linear with the square footage you are trying to cover. There are basically two styles of large single-piece mats: hybrid sit-stand mats (made in a single mold pressing) and long runners that are made by bonding multiple mats together. 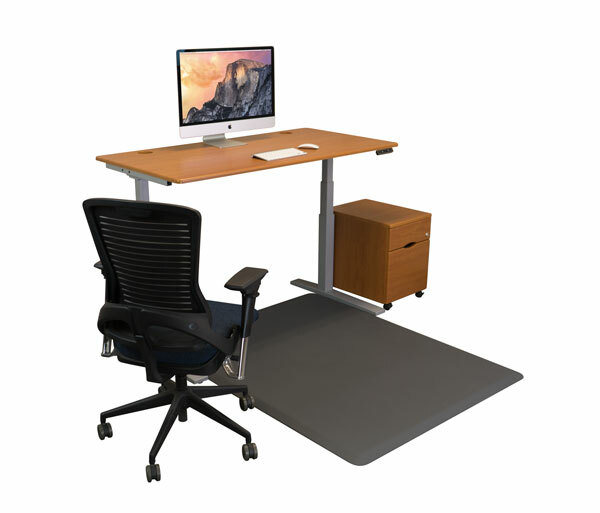 Meant for commercial and office environments these single-piece, large-area mats typically come in a handful of muted colors such as black, brown or gray. If you’re looking for fancier colors for an upscale kitchen environment, for example, skip to the puzzle-piece mat section below for some nice options. These come in sizes like 5’x3’, 5’x4’, 6’x2’ and 6’x3’. That’s about the largest piece size that a manufacturer can get out of a single mold pressing given the flow rate and cooling rate of polyurethane. Going any larger would result in inconsistent buoyancy, surface tension and density of the polyurethane material, and also risk creating air bubbles in the material. These hybrid use standing mats are popular not only for desk users that don’t want to bend down to get their standing mat out of the way when they want to sit, they’re also exceedingly popular in front of workstation benches. For example, Amazon uses 5’x3’ and 5’x4’ anti-fatigue mats in some of their fulfillment centers for workers who stand at a shipping station all day packing items into boxes. See our review of hybrid sit-stand mats for more details. Long-running, single-piece mats do exist. These come in a two-foot or three-foot widths and lengths of up to 23 feet. These runners are manufactured by taking two or more mats, slicing off their beveled ends with a laser, and bonding them together with a super strong adhesive. On the plus side these Continuum mats will never come apart; their edge bonds are that strong. So these are great for places where you don’t want to take any risks with potential tripping hazards, like fire stations. On the minus side they are very heavy to ship (coiled up and shrink wrapped on freight pallets) and longer ones will need to be moved around using a forklift and a crew of brawny dudes. See specific product specs for weight, but as a rule of thumb most 100% polyurethane mats will weigh about .86 lbs per square foot. See our detailed review of these Continuum standing mats (up to 3’ x 23’ long in coverage area) for more details. If you want to cover much larger or more specific areas a puzzle-piece mat may be the best way to go. 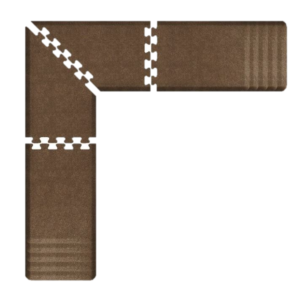 There are off-the-shelf puzzle-piece mats for making long runners or L-shaped mats that can be either 2’ or 3’ wide, or you can go custom and fill any space, no matter how rectilinear or incongruous, with wall-to-wall precision sizing. When it comes to shipping and installing large area standing mats these puzzle piece products offer a significant advantage in that each piece will typically between 2’x4’ (7 lbs) and 4’x5’ (17 lbs) in size, meaning they can be shipped by parcel or stacked on pallets, and installed by a single individual. All of these puzzle-piece mat solutions can be found at iMovR, one of the long-time industry leaders in anti-fatigue standing mats. They are all made in the USA and come with a lifetime warranty, their surfaces are anti-microbial and will never form mold, and they feature a long list of certifications for materials and floor safety. These mats have no odor and do not “outgas” or curl or warp along the edges like many Asian-made mats do. 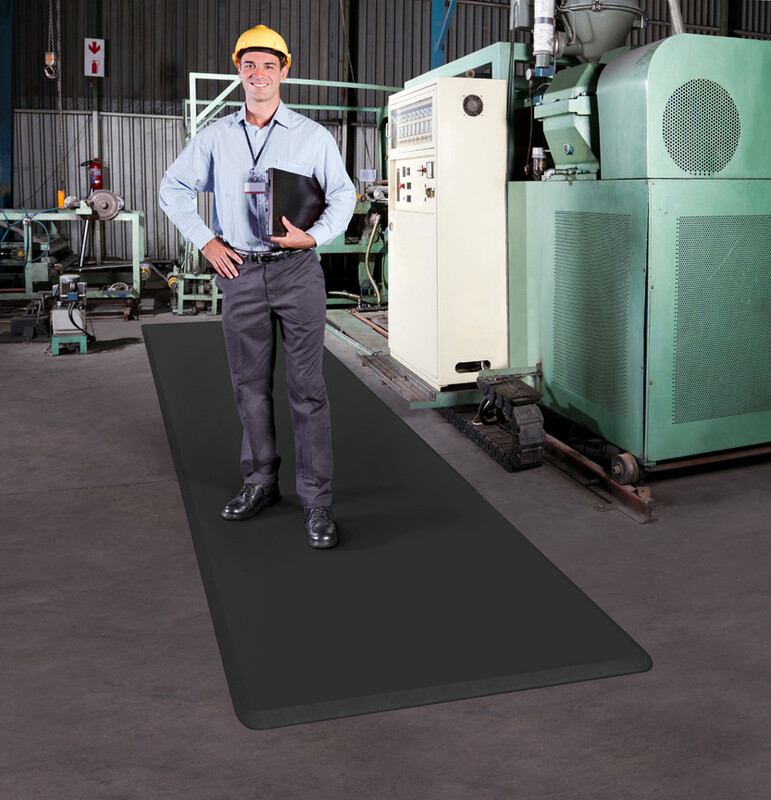 With 20 years of manufacturing history these EcoLast mats are the highest-quality standing mats made, and come in a huge array of sizes and colors, from 18”x22” portable mats to customized, house-sized standing mats. The puzzle edge connections are very firm, and unlikely to ever create a trip hazard by getting misaligned. While you can super glue the edges together for an extra measure of safety note that this will void your warranty. Since single-piece polyurethane molds can’t get any longer than 6 feet, iMovR’s 2-piece solution gets you to bigger lengths that are popular for use in kitchens, workbenches, security desks, pharmacy counters, grocery stores, machining and assembly lines, and anywhere else that 6’ just won’t cut it. The EcoLast 2-Piece Runner standing mat solution is easy as pie. To get lengths of 7.5’, 8’, 8.5’, 9’, or 9.5’, in widths of either 2’ or 3’, this mat comes in two pieces. Just connect the two puzzle edges together and you’re off and running. Pricing is very simple and is tied only to the width of the material. All lengths are the same cost (because they are basically cut down to size from two molded pieces). A 2’-wide mat is priced at $439.95, a 3’-wide mat at $619.95. This product is available in plain solid colors for business environments (black, brown or gray) and gorgeous “granite” colors (copper, gold, onyx and steel), which are speckled like granite to fit in with the elegant decor of modern kitchens. To build an infinity mat you need to have a left-edge piece and a right-edge piece at a minimum, which makes a 9.5’ long mat. Then you can add as many 4.5’-long center pieces as you need to reach your desired length. These pieces come in either 2’ or 3’ widths. If you need a wider runner you’ll need to order a custom-area mat (see below). We know of one Amazon fulfillment center where multiple 4’-wide EcoLast runners each span over 200’ in length. Pricing starts at $399.95 for two end pieces (i.e. 9’5 feet in total length) in 2’ width, and $559.95 for 3’ width. Center pieces (each 4.5’ long) run $200 for 2’-wide and $280 for 3’-wide. Colors offered include black, brown and gray. Designed primarily for high end kitchens these L-shaped standing mats consist of four puzzle pieces. Two triangular pieces make the corner and then the left and right sides can be customized to any length. The L-shaped standing mats come in 2’ and 3’ widths. The length of each side of the ‘L’ can vary from 6’, 6.5’, 7’, 7.5’ or 8’. This matrix of sizes will fit at least half the kitchens out there perfectly without having to go custom. Like the two-piece runners, pricing on these L-shape standing mats is very simple and tied only to the width of the material. All lengths are the same cost (because the left and right ends are basically cut down to size from two molded pieces). A 2’-wide mat is priced at $679.95, a 3’-wide mat at $929.95. Four gorgeous “granite” colors are offered (copper, gold, onyx and steel), which are essentially speckled to fit in with the elegant decor of modern kitchens. These custom mats don’t need to be rectilinear. Individual pieces can be laser cut to fit any irregular space perfectly. To get a quote on a custom-area puzzle-piece standing mat contact iMovR directly with the dimensions of the area you are trying to cover. If the area is an irregular shape it’s helpful to send along a drawing when you request a quote.